Pesto is most often made with basil, but other leafy greens and herbs can also make very interesting pestos. Toss this with hot pasta, and a little of the cooking water from the pasta (to thin it into a sauce), or stir it into rice or risotto. You can keep it covered in the fridge for several days. Place the garlic in a food processor fitted with a steel blade and puree to chop the garlic. Add the kale and the parsley and pulse until the greens are finely chopped. Season with salt and pepper, then pulse in the Parmesan cheese but do not puree or overprocess. Parmesan cheese (known in Italy as Parmigiano-Reggiano) is a hard, granular cheese. It is named after the area of Italy in which it is produced, and authentic Parmesan can actually only come from certain areas of that country, according to Italian law. Outside of Europe, the name "Parmesan" can legally be used for cheese made in the Parmigiano-Reggiano style, but not the full name. Parmigiano-Reggiano is made from unpasteurized cow’s milk, and there are many strict guidelines around how authentic Italian Parmesan is made. It is an aged cheese, and often the more aged it is the more pronounced the flavor and the more expensive. If you buy a domestic version of Parmesan that’s also fine; if you are so inclined, buy Parmesan in chunks and grate or slice it yourself, or buy it in a market or cheese shop that grates their Parmesan regularly, or has a high turnover of packaged grated Parmesan. Only buy it in the cheese case, never buy the stuff in shelf-stable cans. Parmesan is often grated, finely or coarsely, and used in pastas, sauces, risottos, and soups. It can be thinly sliced over different dishes and salads, and it can also be eaten straight, broken into small chunks or shards, which is very common in Italy and throughout Europe. Americans use it more in cooking. If you want a looser pesto, add more olive oil. 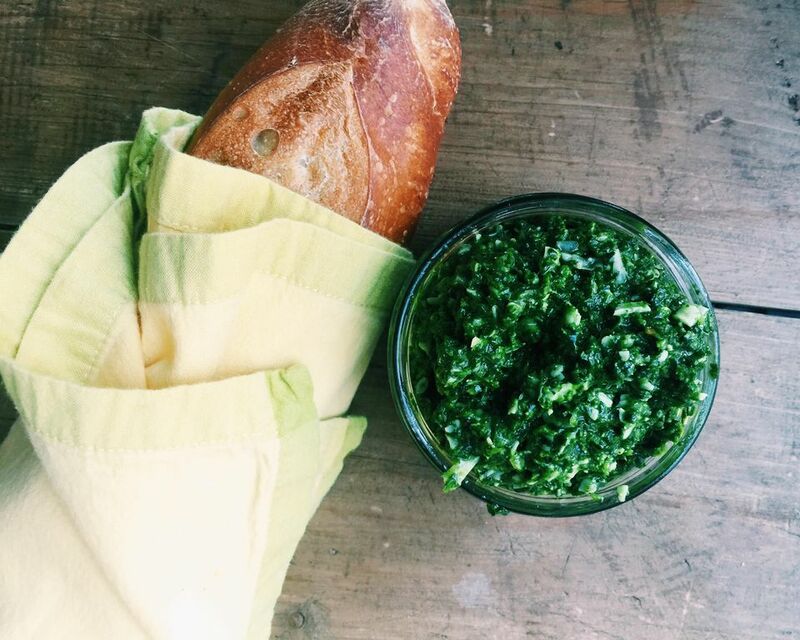 If you want to add 1/4 to 1/2 cup pine nuts to this when you add the kale, go right ahead – traditional pesto has nuts (most commonly pine nuts), though this recipe leaves them as optional, good to think about with nut allergies so common. Other uses for pestos are on top of a toasted piece of bread brushed with olive oil, then maybe topped with mozzarella or goat cheese as a crostini; as a sandwich or wrap spread; or mixed with plain Greek yogurt, crème Fraiche or sour cream as a dip. Try other hard grating cheeses instead of the Parmesan. I made this with Gruyere and used it to top a black bean (gluten-free) pasta and it was great. No nuts, so the dish was good for people with allergies to nuts and gluten, which is rare in a pesto pasta dish.